This is the one that’s got the press salivating. The one that’s got gamers hyperventilating. 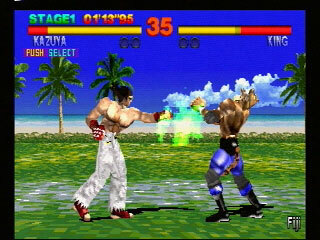 This is Tekken. Eight deadly fighters engaged in the ultimate battle for supremacy. Winner goes home filthy rich. Loser goes home in a pine box. Rib-shattering realism. Namco’s system 11 technology puts you in the fight. The unpredictability. The aggression. The psyche job. The real deal. Better than “Arcade Perfect.” The original eight characters, plus 10 more as your skills progress. Even a “VS.” mode with damage settings. More moves, more action. Each fighter has their own arsenal – everything from high level martial arts to brawling. 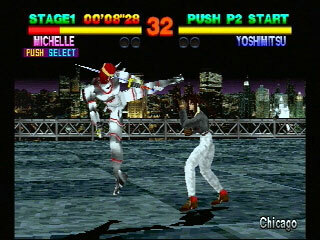 Characters can chain up to 10 devastating attacks. Fully realized 360 degree 3D world. Movie quality SGI cinematics. You can almost feel the kicks and punches land. Super smooth texture mapped polygon animation, motion captured martial arts moves. What can be said about the Tekken series that hasn’t been stated before? 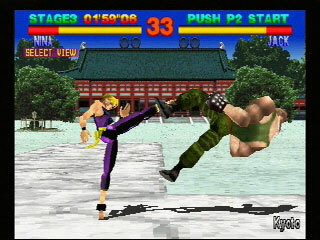 It’s only the fighting game series that solidified the PlayStation’s stranglehold on the gaming crowd, was the first PSX game to sell over 1 Million copies, and holds some of the most memorable characters ever designed in fighting game history. So yeah, it’s been places. The original installment followed a somewhat clichéd storyline; Heihachi Mishima, talented martial artist and head of a huge corporation is holding the “King of Iron Fist Tournament.” To the victor go the spoils and riches. As the tournament begins, there are only 8 combatants left to claim the prize. Based on a 4 Button layout, Namco opted for a neat twist on the button allocation. 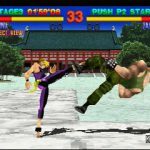 Rather than High and Low like Mortal Kombat, or the advancing strengths of Street Fighter’s, they opted to assign each button to a limb; one for right and left foot, as well as left and right hand. This allowed a more logical explanation to the thought process in developing and remembering combos, since moves were performed by the proper body part. Players could now ‘dial in’ combos by just remembering the animations. Those quick enough on the draw could then perform the devastating 10 to 11-Hit combo patterns that lay buried deep within each fighter’s arsenal. 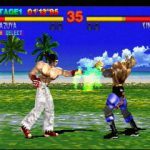 Although 3D in graphics, Tekken is a 2D game, while play fields will automatically scroll so that a player can not be trapped against a wall. Blocking is performed by pressing back on the controller. Once you plow through the other 7 characters, you would face a sub-boss. This opponent was based entirely on who you picked, and would become playable once the game was beaten. Considering this was basically arcade exact, especially now with the PlayStation 2’s Smooth and Fast Load functions, the game still holds up after all these years. Granted, there’s no tagging, no super-moves, no nothing – but then Tekken never needed that. Tekken has aged like a fine wine. You don’t drink it that often, but when you do it’s always a fun time. This is the first PlayStation game to ever sell 1 Million units. 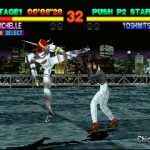 Tekken’s hidden characters really are hidden. Once unlocked, you must scroll off-screen to select them. Like Ridge Racer, while Tekken is being loaded into RAM, you can play a mini game based on one of Namco’s older arcade games. In this case, the loading screen game is the bonus stage from Galaga. Tekken features 4 camera views that are chosen by player one in the first 10 seconds of the round. These views are Standard, High, Above, and Ground. Features two different Attraction screens: Movie based and actual game play footage. Namco still uses this format today.